By now you've seen the video of Jim Joyce blowing the call and taking away Armando Galarraga's perfect game. The game was Wednesday night and the Detroit Tigers were hosting the Cleveland Indians at Comerica Park. I feel for the umpire, and I can't even imagine how bad he feels for making the bad call. I also can't believe the reaction from Armando Galarraga. While I'm sure Ernie Harwell rolled over in his grave at the umpire's mistake, Galarraga simply smiled when the bad call was made. The poise that Galarraga showed and the strength it took for the umpire to apologize amazed this sports fan. In a time when almost all the stories are about athletes and some sense of entitlement or unprofessional behavior I commend these two gentlemen for taking the higher road. It's my understanding that Bud Selig won't reverse the call and Galarraga will be denied the perfect game. Galarraga would've been the first to pitch a perfect game for the Detroit Tigers, and Wednesday night's performance would've been the 3rd perfect game pitched this season. I guess Galarraga's performance will be the text preceded by an asterisk in the history books, until he pitches a PERFECT GAME again. 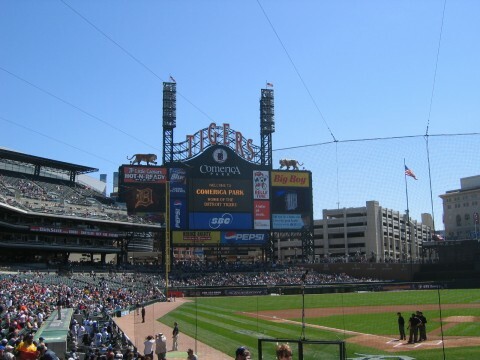 Coincidentally, in 2005, I went with friends to Detroit to visit Comerica Park and witnessed the same Indians v Tigers match-up. A picture I took from my seat is here for you enjoy.